Since I always play on the II I'm not sure I would know what is broken/missing. I'll go watch (listen to) the Intellivisionaries. Does the LTO Flash come where you have to sign for the package if you ordered it from Level Up ? I got a slip of paper from the USPS saying they missed a Re Delivery and that I can pick up the package they tried to deliver tomorrow after 5pm Saturday 9-17. I finally got my LTO Flash! today, safe and sound. Somehow the box miraculously survived, it's perfectly intact! Thank god. Here's a pic I posted earlier on Instagram. Cool a Sears Super Video Arcade! I have a Frankenstein Intellivision, it's a Original Intellivision 2609 bottom and circuit boards with a Sears Super Video Arcade Top so I get the benefit of the Mattel Intellivision without it removing the Copy Right Mattel Electronics and the benefit of the removable controllers of the Sears Super Video Arcade and not annoying Intellivision 2 crappy controllers. I lost the thing that goes on the power switch so it's hard to turn off the Intellivison so I put a switch thing-gie on the plug that I got at Wally World. This way also preserves the Transformer that I think goes bad with age if you leave the Intellivision plugged in too long. Cool Joystick too looks like you have 2 of them. Edited by daldude, Fri Sep 16, 2016 10:32 PM. Weekend is finally here and what better time to open my package and give this thing a whirl... except I got a dud! Someone goofed (imo) when cutting the hole in the cart and left a huge gap! Shouldn't this make it more valuable?? The odds of you getting a 'dud' are very low. These are tested very well at the factory. Contact LTO and I am sure they will go over some procedure to troubleshoot whatever problem you are having. I believe Level Up's deliveries do require signature confirmation. "Shorting out?" I realize that's short-hand for "not working." Could you describe what's happening? (PM if you prefer, or email at intvnut@gmail.com ). Whats the quickest way to get this rectified? If there's actually something wrong with the cart, I'll be happy to swap it out quickly. However, it's also entirely possible you just need to install some drivers for your computer to see it. We've discovered that a seemingly random subset of Windows machines don't have the current FTDI drivers included, for example. (It's not isolated to any one version of Windows.) If you are running Windows, please run the FTDI VCP driver installer and see if that allows your computer to see the cart. OK, the gap on the side away from the USB connector looks like a goof on my part. Some of the shells curl slightly when they come out of the mold, and don't meet at the end properly. I discard those, because they're not usable. I thought I had caught and discarded all the spoiled shells, but it looks like one slipped through. If you can get the cart working by installing the FTDI VCP driver, then probably the easiest thing to do is for me to send you a new shell and label. You can use the cart in the meantime. When the new shell arrives, pop the board out of the old shell and into a new one, and apply the new label. Use the old shell as a door stop, drink coaster, conversation piece, or to level a seriously-un-level table. If the board itself is bad, or you'd rather not swap the board to a new shell yourself, then I can swap carts with you. Send me yours and I'll send you a replacement, ASAP. Send just the cart to me. The shells are Lexan and tough as nails (unlike cardboard), and so you should be safe using a bubble mailer to return it to me. And what's the loss if a warped shell gets cracked? I'll still use a box to send yours back to you, though. Edited by intvnut, Sat Sep 17, 2016 12:10 AM. Mine arrived today. That was fast! I'll be honest, I don't know that I ever noticed the reported issues w/ either Space Spartans or Shark! Shark! on the Intellivision II. I'll have to pop both in and turn my ears up. If the stated reason (timing differences due to the different EXEC) is true, then using the Inty 2 EXEC with jzIntv should cause the same problems. Some Intellivision II units use an AY-3-8916 rather than AY-3-8914, IIRC. The AY-3-8916 has some other weird behavior that I don't emulate in jzIntv. For example, the unused bits in various registers read back with hand-controller information, rather than 0. Space Patrol, as a result, plays incorrect sound effects on my INTV System III, and probably some Intellivision II units. I probably couldn't tell without someone pointing it out to me. The episode 28 podcast plays the space spartans sounds back to back at 4:03:00. I haven't heard about intv system iii sound problems before. Maybe the problem is with the sound chip and not the exec? 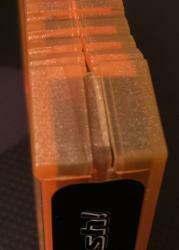 Other Intellivison II had an ay-3-8914a chip variation ( https://console5.com...ntellivision_II ). Edit: There is, supposedly, fixed Super Pro Football cartridges out there. Edited by mr_me, Sat Sep 17, 2016 4:38 AM. I'll have to have a listen. Speaking of AY-3-8914A, I had just run across that designation again the other day looking at the procurement specs on Papa Intellivision. Flip to page 98. (It gets really boring at work while waiting for some jobs to run. Time I can't spend on LTO stuff, either.) EDIT: Starting around page 111 of that document is the closest thing I've seen to an official STIC spec. Rather than down-counters, use up-counters and a comparison to know when to toggle the output between 1/0. Remove the 2-bit "envelope volume shift" from bits 5 and 6 of the volume register, and have a single bit envelope select in bit 5. Disable the I/O port direction bits, so the I/O ports are input-only. You can find all those modifications if you dig long and hard enough at Papa Intellivision (flip to the last page). Edited by intvnut, Sat Sep 17, 2016 5:30 AM. Edited by intvnut, Sat Sep 17, 2016 5:33 AM. Just a short update shipping update: All new orders are on their ways, tracking information has been sent out as well. I looked at what Space Spartans does to get the "gritty" explosion. It programs $0000 into the pitch period for channel A, while putting noise on channel C. It fades that out with an envelope. On the original AY-3-8914, $0000 is the maximum period pitch. But, if you look at the MAME source, they say on the AY-3-8910 a period of $0000 is the minimum pitch period (and would be fairly inaudible). That suggests to me that the "thinness" on those explosions results not from a timing difference in the EXEC, but rather a difference in how the counters are managed inside the PSG chip itself. The MAME documentation also mentions the count-up-and-compare method (which also matches the proposed AY-3-8914 changes seen on PapaIntellivision), again suggesting this was an AY-3-8914 => AY-3-8914A change that also made it into the AY-3-8910. That's not to say there aren't EXEC timing differences also at play on some sounds, but for the Space Spartans explosion sound, it looks like I found the smoking gun. As for SP Football, it's really weird. (And it feels like deja vu typing this, as I think I looked at this once before many moons ago.) The crash happens when a piece of code sets the stack pointer to $200, does a GRAM reinit, and then clears BACKTAB (which is also at $200). The BACKTAB clear wipes the return address, and wackiness ensues. The really weird thing is that that code only runs on the Intellivision 2, and not because a timing change. Rather, the code looks at a single location in the EXEC that differs between the Sears, Inty 1, and Inty 2, and only runs this crashing code on the Inty 2. $A6A3: 0004 001E 0335    JSRD R4,$1F35      ; GRAM reinitialization? The crash results when returning from clearing BACKTAB. The stack pointer still points into BACKTAB. On calling the clear function (JSR R5, $1738), it pushes the return address on the stack (which is in BACKTAB). Then it wipes all of BACKTAB to $0000 (which also wipes the return address). On returning from the function, it pops $0000 off the stack, and *BLAMO*. The instructions starting at $A6A1 are never even reached when running with the Intellivision 1 EXEC. Here's the bizarro thing: It appears purposeful! Leading up to the code that crashes is the following sequence. It reads a very specific location in the EXEC ROM and sees if it's the value $0004. On the Intellivision 1, it's $02BC. On the Sears unit, it's $0200. On the Intelliviison 2, it's $0004. So, clearly they had something in mind here, but what? Maybe they were working around something else on the Intellivision 2, and thought they had it fixed, but not quite. Edited by intvnut, Sat Sep 17, 2016 9:24 AM. Nice detective work, Joe. Sounds like I need to have a talk with Dave Warhol and see what he remembers about this - probably when we [eventually] cover the football games. Edited by ho11ywood885, Sat Sep 17, 2016 10:38 AM. Stupid Post Office closed at 1 and I had to work till 3:30, why did they not just try to re deliver it again? There is usually someone home at my Parents (Yup I live with them and my room is in the basement where the Intellivision and my other systems are) all day so the Mail Man could have just had one of them receive it. It's not like I'm with the FBI or NSA and they want to make sure Snowden does not get his hands on my LTO Flash. Edited by daldude, Sat Sep 17, 2016 3:06 PM. Got mine yesterday, love it! Loaded up over 250 roms Played some ECS games...can't wait to try some that I've never tried...my dad is excited because now he can play the games he remembers that I don't have. OK, thanks. Even if there is pressure on that connector (which is possible if I didn't make a big enough notch for it), if the USB cable can still be inserted, then there's nothing that can "short out" there. But definitely, I at least need to get you a different shell, it sounds like. Let me know how it goes and we'll know how to proceed. I got my cart from Joe yesterday shipped in a nice sturdy box. I installed the s/w on my Win10 laptop, plugged in the cart and loaded up about 50 ROMs without any problems. The s/w seems pretty intuitive and easy to use. Didn't read any instructions. I don't have my Intellivision setup yet since moving to my new place so can't test it now. Hopefully I can try out a few games tomorrow. Very happy with the cart so far. So is the fix to set the pitch period to $ffff? Do INTV systems and AY-3-8917 have the same problem? Well, $0FFF, since the period is only 12 bits, but yes, I believe that would fix it. Different starting address ($1F0 for AY-3-8914/8914A/8916, $0F0 for AY-3-8917). Some of these variations can be tested for in software, I think. But others will require a human to listen. Edited by intvnut, Sun Sep 18, 2016 4:32 AM. If your addresses above are correct, it looks like $A69F is branching to the operation after changing the Stack Pointer ($A6A3), or am I missing something? If so, what sort of mechanisms would lead it to arrive at $A6A1 instead, where the SP is updated to point to the origin of BACKTAB? Edited by DZ-Jay, Sun Sep 18, 2016 5:43 AM. Okay, so Space Spartans might be patched with a cfg file and LTO Flash for Intellivision II owners. If I can figure out how the sound effect is encoded, yes. Wow. This is the kind of thing that would be really handy to have documented for homebrewers. One thing I don't really test thoroughly is to make sure each sound effect sounds "just right" on every one of the possible hardware units. I assume jzintv only emulates one of the PSGs? Given that I've already detected differences between emulator and hardware on certain sound effect tricks, I'm (minorly) scared about what happens when someone tries my code on their Tutorvision!